Swarovski Crystal Elements are a perfect way to jazz up an old jacket or pair of pants. Add a sparkling crystal button or some rivets to embellish your new design project. Swarovski Buttons and Rivets are stunningly attractive, and will add style to anything they are attached to. The easy to use Swarovski Buttons attach just like any other Button, but are so much more beautiful! 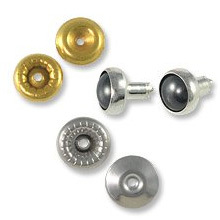 Try our Swarovski Crystal Rivets to adorn clothing, or on Bead Strands and Necklaces.